Tlatchi was a game played by the Aztecs and some individuals have claimed that it is over 3000 years old. We cannot verify this but it is quite possible that the game was being played around 500 BCE. This would make it older than the Chinese game of Tsu Chu. However Tlachtli was more a mix of basketball, volleyball and football rather than just a forerunner of football. One key rule was that players could not use their hands, although they could use their heads, elbows, legs or hips(?). The ruins of almost every ancient city include a walled court for the sacred game of Tlachtli. The courts were often close to temples, reinforcing the spiritual nature of the game. Tlatchi has been described as a spectator sport, an astrological study and a political engagement all at the same time. 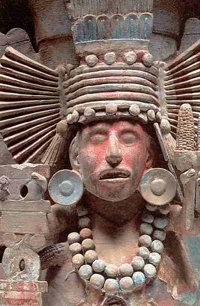 The sense of astrology comes from the fact that the Aztecs and particularly the priests felt that the movement of the rubber ball during the game symbolised the future path of the sun. Great prominence was given to the mystic similarities between ball and sun.Only the ruling elite were allowed to watch the game and gambling on the outcome of the game was very popular. Money, clothes and even slaves were bet on games. Tlachtli was played in a sunken stone walled court surrounded by fans. The court was normally an ‘I’ or ‘H’ shape with one stone ring at each end of the court. (The stone rings were similar to basketball hoops and were 8-10 feet off the ground. The actual hole was less than 30 cm wide. The actual game involved passing the ball from side to side without it touching the ground. If the ball fell to the ground on the other side your team would win a point and vice versa (similar to volleyball.) If you struck the ball with an incorrect part of your body you could lose points for your team. However the real purpose of the game was to get the ball through the hoop at each end. The team that did this first won, irrespective of the current score of the game. Players were given kneepads and helmets to protect them from the heavy rubber ball, although this was only a temporary measure as the losers of the game were sacrificed to the gods!